With over 1,000+ informative sessions, hands-on workshops, and access to the latest edtech resources from hundreds of exhibitors including NetSupport, TCEA 2019 was one of its biggest and best yet and, for NetSupport, it was non-stop for the entire duration! 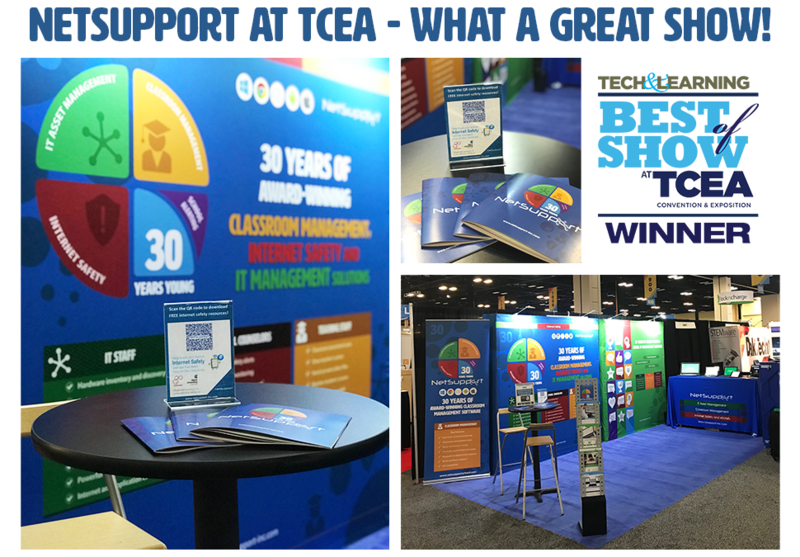 In addition to showing the latest features in our education solutions, Tech & Learning announced the winners of the TCEA 2019 Best of Show Awards – and we are pleased to announce that two of NetSupport’s solutions, NetSupport School and NetSupport DNA, have won! Classroom management solution, NetSupport School, is known for supporting schools in maximizing the benefits of technology-led instruction through its range of PC and device monitoring, assessment and collaboration tools. Meanwhile, IT Asset Management solution, NetSupport DNA, provides schools with easy-to-use IT asset management features to effectively track, monitor and manage IT assets across a school and its sites – while safeguarding students with its built-in internet safety module.